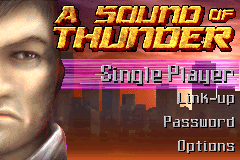 A Sound of Thunder is a licensed game developed by what is now Rockstar Leeds (the wing of the company responsible for the Grand Theft Auto Stories series) based loosely on the 2005 adaptation of a Ray Bradbury story. Essentially, a private company is using the recently invented time machine to take people on safaris to the past. Someone on the most recent "time safari" has returned to the present with a butterfly, and alters the course of history. This brings weird time ripples which bring mutants, dinosaurs and strange vegetation to the modern world. The game obviously has more of a science fiction plot than horror, but all of your standard horror tropes are there- limited ammo, infrequent health drops, and puzzles. 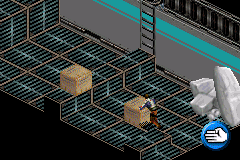 The game utilizes an isometric perspective to convey a 3D world on the GBA's limited hardware, and the game's graphics engine was later used for Max Payne, and they're actually pretty impressive for the time. So, we have a decent setup for the game, and it shows promise based on the pedigree of the developer. 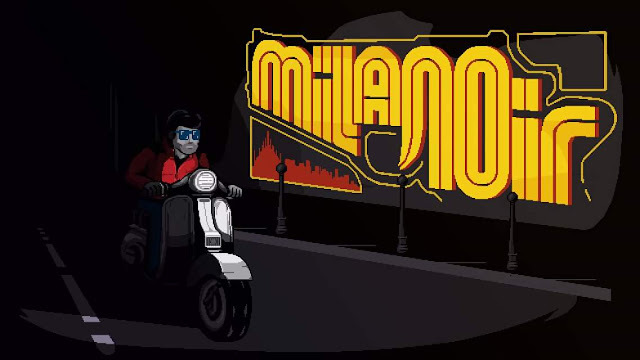 Unfortunately, there are a few things that really prevent this game from being even halfway decent, and it comes across more as a learning project than an example of what was to come. The controls are the first thing to mention. 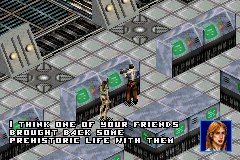 Games with an isometric perspective are notorious for having games that make the perspective work and downplay its drawbacks, and games that forget that jumping is the worst thing you can make your character do. This is definitely one of the latter. Moving around the stage is fine when you're just walking, but the second you need to clear a chasm or jump on to a box (which you will do a lot), everything goes right out the window. The controls are not precise enough to make an on the go jump and have your character do what you want him to do, and that's a huge issue when you first start the game with a giant crack in the street, and an army of small mutants jumping at you to hinder your progress. Clearing the crack becomes a much easier task after you have cleared out the mutants, but here's where another big problem with the game comes into play- everything is a bullet sponge, but you need to conserve ammo. While the game thankfully has an auto- target feature for shooting at your enemies, you only shoot in one perspective at a time, and the touchy controls can make it difficult to reorient yourself after you clear the enemies that are being auto targeted, which results in a lot of health going away very quickly. It's also really difficult to tell when the enemies have finally died, because they don't fade or disappear until after a few seconds have passed, and they almost look the same dead on the ground as they do on the ground, but poised to jump, especially when you usually get attacked by those enemies in swarms. Also, it breaks the unspoken rule of "A button jump, B button shoot" by reversing their order. 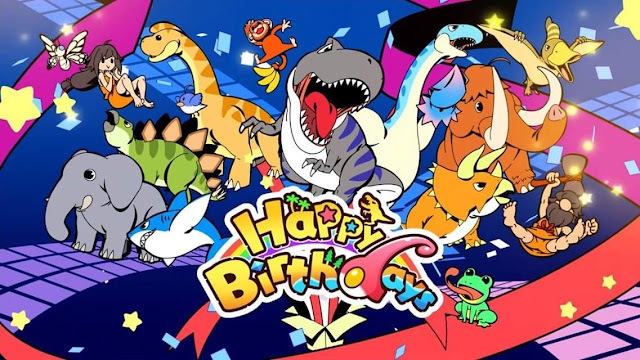 After clearing the first area, you are subjected to a vehicle stage, in which you are trying to race around town, through barricades, while being pursued by a dinosaur. 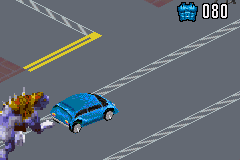 While the main game engine's isometric room structure works ok for navigating as a human... it is not intended for the higher paced action necessary when in the car. This is confounded by the car "rooms" being so small, and becoming disoriented by the screen fading to black and the car resetting itself to the opposite side of the screen (exit screen A on left, start on screen B's right hand side). The car controls horribly, of course, but it's nothing too different than we were used to most vehicles controlling in most 2D games of yesteryear. Something you begin to realize as you get more weapons and encounter some different kinds of enemies, is that the amount of damage necessary to kill them doesn't seem consistent. 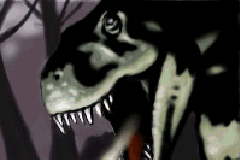 While it is possible that certain enemies might have weaknesses that were not described in game, it seems weird that a jumping spider mutant that takes 10-15 bullets from the initial gun can take 2-3 shotgun shells, but the raptors that take twice as many bullets from the original gun only need one shotgun shell. The game's only redeeming feature is it's occasional breaks in the imprecise platforming and bullet sponge enemies for "push the box" puzzles. These aren't too difficult by any means, but it is oddly satisfying to get the boxes lined up just right when dealing with the sometimes confusing differences in floor/platform heights. It's also telling of how muddy the controls and unrefined the rest of the game feels when you come out of a shooter having enjoyed pushing boxes around more than killing stuff. I knew going into this that I wanted to find some handheld horror games to highlight, and they weren't all going to be good games. However, I'm very disappointed that this game didn't even really soar past the low hills of mediocrity. Remember to check back tomorrow for day 4 of the 31 days of Halloween celebration. You can also catch up below.